After creating an organisation you have the right to modify its attributes. On the organisation page, you can see a “settings” button on the dashboard. Once you click on it, you see the options. Firstly you can change the name of the organisation or specify it. Then you can add the URL of the website of the company. Furthermore you can give an e-mail address of the company. Bear in mind, that these actions are not compulsory. You can add company picture for your organisation too. For this feature you need to upgrade to Hat-Trick. Now we have come to a more privacy and policy question. Subsequently you can select if people can set in which department or position they are. This is important because you can create matches or tournaments among departments. You can allow or deny participants of the organisation to launch challenges. Bear in mind, if you ban people from organising games, less proactivity is expected from the participants. The whole Battlejungle model is based on the bottom-up communication and organising principle. Therefore we strongly recommend you to allow co-workers to organise events freely. Lastly you can give a description to the organisation that will be available to see to every participant in it. Most importantly you can connect Slack to your organisation. This enhances communication as Slack can notify you. After clicking on “Add to Slack” you can set up, in which communication channel you would like to receive updates and notifications. These notifications will consist of match updates, information about your next game and challenges. In terms of challenges you will have information about newly opened tournaments, invitations, and application deadlines. All in all, if you use Slack, we strongly recommend you to connect Battlejungle to it, as you don’t have to check e-mails for information. 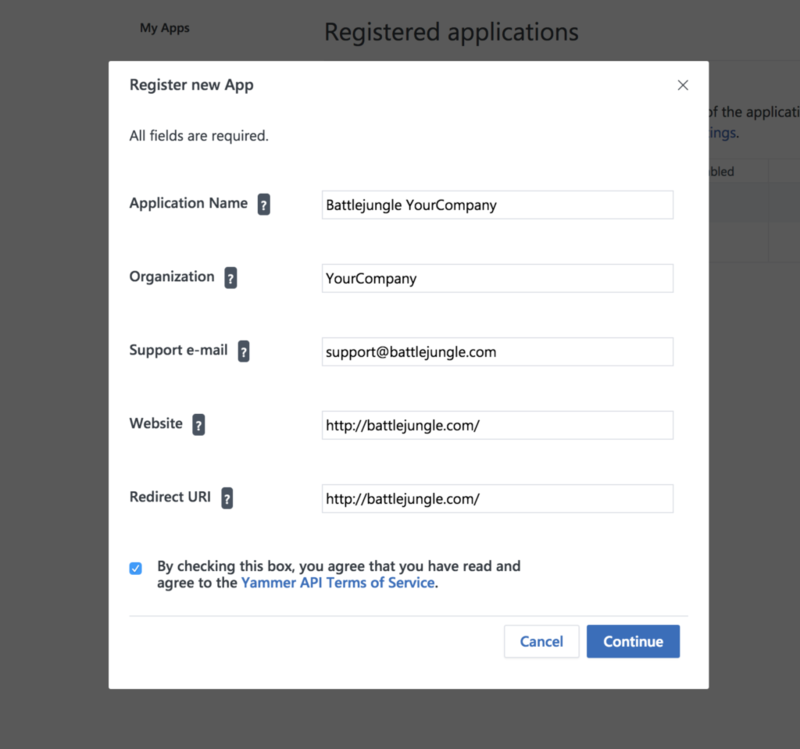 In order to integrate Battlejungle into your Yammer network you have to create a Battlejungle App for your network. This only takes a few clicks. The first thing you have to do is create a new user in your Yammer network. 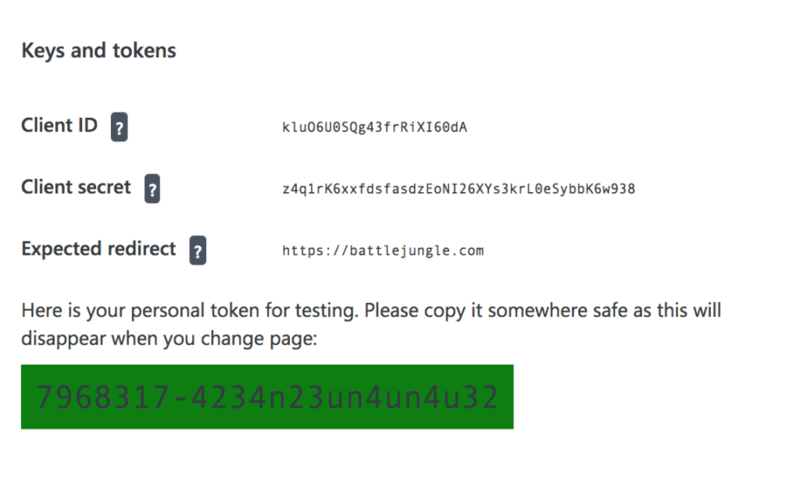 Every message you receive from Battlejungle will be published in this user’s name, so we advise you to give it a name that is related to Battlejungle. The next step is creating the Battlejungle app in your network. Every user has the permission to create a Yammer app which will only work in the network you created it. This is the last step. After submitting the previous form you were redirected to a page where you can find some basic information about the app that you just created. 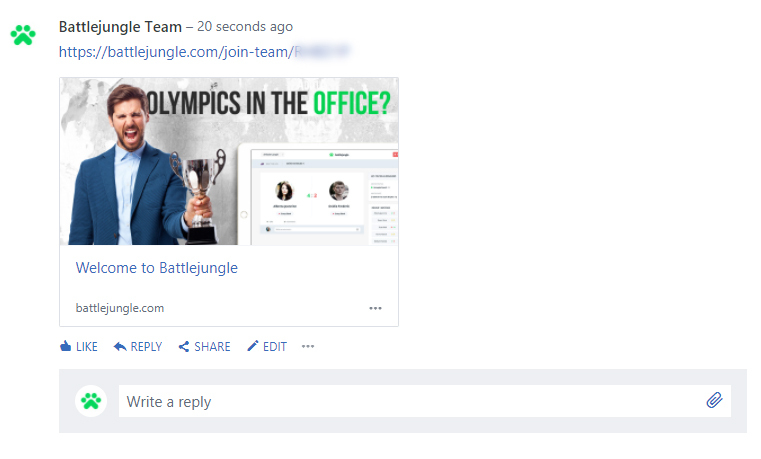 On Yammer, go to the group where you want to receive the Battlejungle messages. The messages will be posted only here. At your group’s page, in the URL you will see „in_group&feedId=”. You have to copy the number right next to it and paste it to the same Yammer integration page on Battlejungle as the developer token to the „group id” field. For organisations using our premium plan, we provide the opportunity to promote themselves to their employees. You can find these customization options inside the Settings, on the Branding page. Your organisation’s logo will appear in multiple places: your organisation’s registration page, e-mails sent out by Battlejungle and everything your employees share while using our system. This image is placed on your organisation’s Battlejungle dashboard. After logging in, it will be one of the first things the user sees. 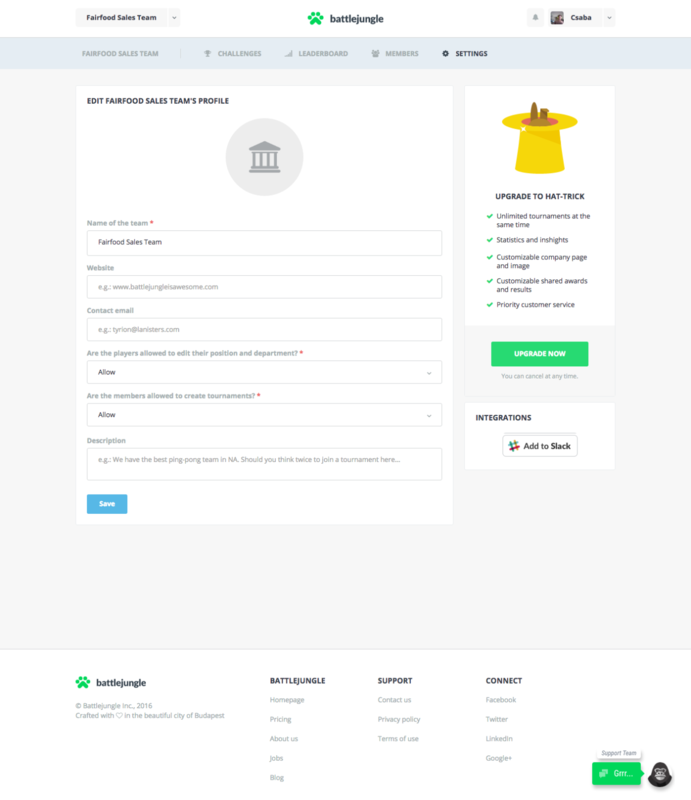 Aside from your organisation’s logo, a background image will greet the users who would like to register to your organisation’s Battlejungle account. You can invite members to your organisation using a sharing link. Whenever you use this link on a social media service or any other site that uses the Open Graph protocol, this image will appear above the link if you paste it. Adding a custom image here may help getting the attention of your co-workers when inviting them.